Join co-Hosts Marshall and Rubble for Nick Jr. Live! 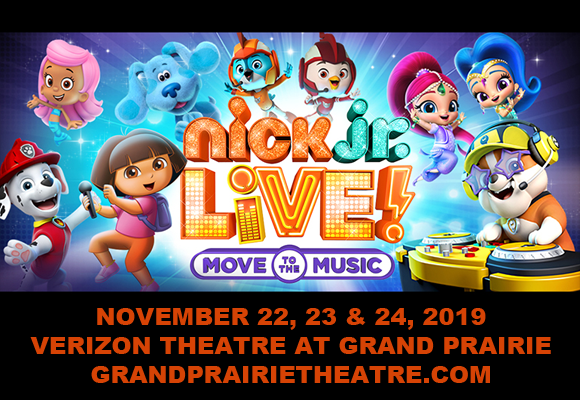 Move to the Music – an all-new musical experience coming to Verizon Theatre at Grand Prairie on Sunday 24th November 2019! A must for any little Nick Jr. fan, Move to the Music is a playful and upbeat interactive show that brings all the larger-than-life characters from Bubble Guppies, PAW Patrol, Dora the Explorer, Shimmer and Shine, Blue's Clues & You!, Blaze and the Monster Machines and Top Wing to the stage!